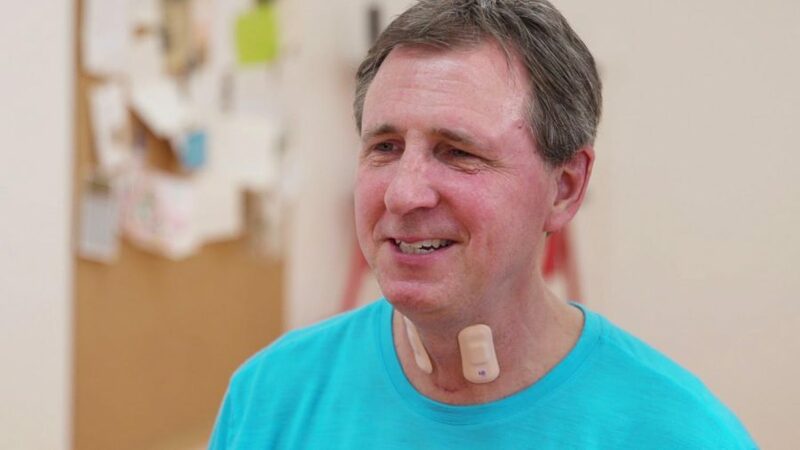 A man wears throat sensors designed by McCormick and Feinberg Prof. John Rogers’ lab, in partnership with the Shirley Ryan AbilityLab. Northwestern researchers partnering with a research hospital in Chicago have developed a wearable throat sensor that could help patients undergoing rehabilitation after stroke. According to a Feb. 17 news release, McCormick and Feinberg Prof. John Rogers’ lab, in partnership with the Shirley Ryan AbilityLab, developed a stretchable electronic sensor that helps diagnose and treat patients with aphasia — a speech impediment that can result from stroke. The sensor may help facilitate the recovery process of stroke patients even after they are discharged from the hospital. Tools traditionally used by speech-language pathologists — who diagnose and treat speech and language problems — cannot distinguish between patients’ voices and background noise, according to the release. According to the release, the throat sensor measures patients’ swallowing ability and patterns of speech. Rogers told The Daily that the throat sensor lasts 12 hours and is meant to be worn throughout the day. The device can be recharged while a patient is asleep, which is when monitoring speech is not as important, he said. Feinberg Prof. Arun Jayaraman, who is a research scientist at the Shirley Ryan AbilityLab, told The Daily that the throat sensor is among several sensors created to help stroke patients, including some designed to monitor movement and cardiac behavior. Multiple sensors can be placed on different parts of the body to capture a detailed, “full-body assessment of one’s physiological health,” Rogers told The Daily, adding that his lab has been working with the AbilityLab to develop sensors that track a patient’s status as they go through rehabilitation. Jayaraman told The Daily that the sensors, which enable doctors and clinicians to keep an eye on the patients after they have been discharged from the hospital, will help provide individualized care for patients on a more real-time basis. The devices may help expedite patients’ recovery process, he added. Jayaraman said Rogers developed the “hardware” for the sensors, while the AbilityLab takes the data from the sensors and creates specific algorithms to monitor specific impairments.